Give your favorite couple a truly beautiful Personalized Couple Gifts Photo Cube. Our Engraved Photo Cube is a wonderful gift for the Wedding Couple or newly engaged couple. Celebrate the love you have for one another with a beautifully engraved Photo Cube displaying your favorite 4 photographs. 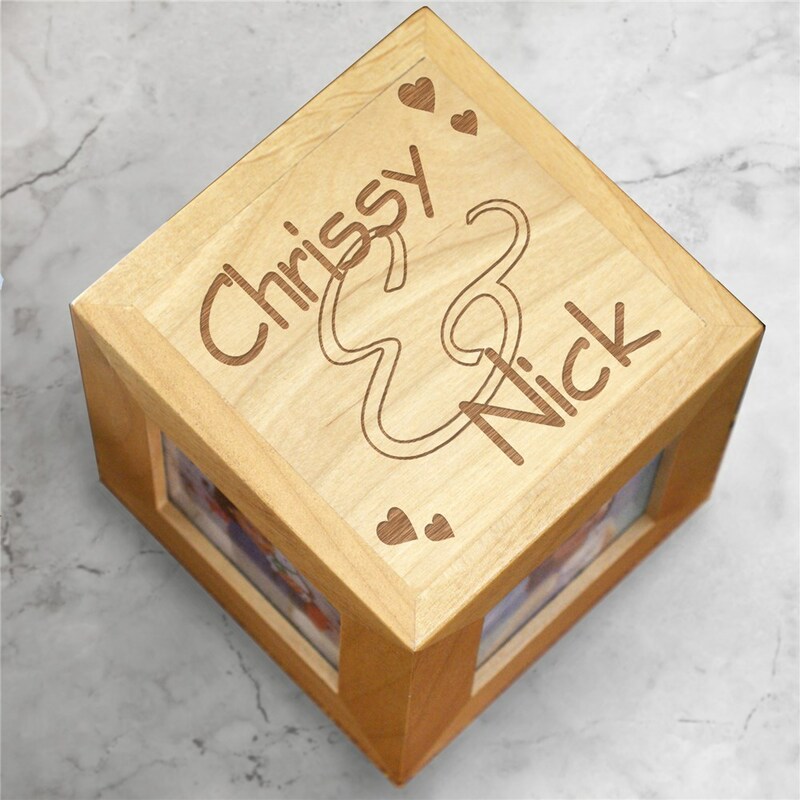 Our beautiful natural wood 4.5" personalized photo cube features 4 separate photo openings measuring 2.5" x 2.5". All Personalized Gifts for Couples include FREE Personalization! Personalize this great romantic gift with any couples names. Makes a great Personalized Valentine's Day Gift for Her or Him. Also makes a Personalized Wedding or Anniversary Gift. Wonderful quality and absolutely beautiful. Order came much faster than I had expected. I did not get to see it in person because it was a gift sent to another part of the country. It looks beautiful in the picture and was great for a couple that did not send us any gift registry. An Engraved Photo Cube Keepsake is the perfect personalized gift idea to give to that special person in your life. Your best friend will love this gift & cherish it for years to come. Our Engraved Keepsakes make unique gifts for a Personalized Birthday Gift, Bridal wedding shower gift or just because. A Personalized Photo Cube is also great Personalized Gift Ideas for Valentine's Day, Weddings, Anniversaries or any Romantic Gift Giving Occasion. Get all your Personalized Photo Cube Keepsake Gifts at GiftsForYouNow.com.